Tired of eating out for lunch? Do you want to prepare your own lunch meals, but don’t know where to start? Studies show that we consume more calories when we eat out, between 100 and 1,000 more per meal! As Latinos, it’s important to know that eating a balanced meal and being active can give you more energy, help you look better, help you concentrate better, help you feel better about yourself and keep you healthy, but it’s not always easy to do. Specially, during the back-to-school season, when routines change drastically- not just for students, but for parents too. So if you are agonizing about what to pack for lunch, relax, help is on the way! When you’re planning your meals always try to keep a few extra portions to prepare lunches for the week. You can simply grill an extra piece of chicken or save an extra serving of a pasta salad for your lunch meal. Try cutting your lean protein into strips or bite size pieces and place them into small freezer bags. And, always add cabbage, carrots, beets or bell peppers because they are easy to freeze and can turn a wrap into a colorful nutritious lunch. Below is an easy-to-follow chart to guide you while you prepare your meals. 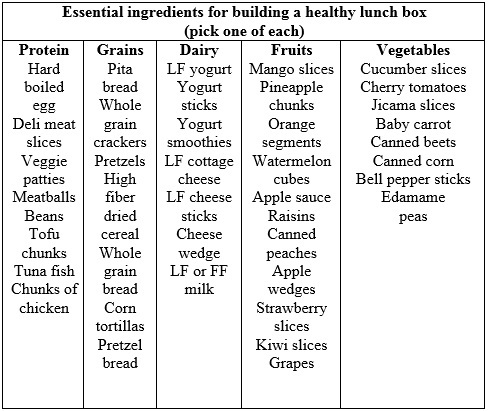 Simply, choose an item from each column and pack them in a lunch container. By choosing foods from each food group, you can be assured you are getting enough of the nutrients you need every day. The road to a healthy and fit body is not complicated. Try to keep a healthy weight by first finding out the weight that is healthy and try to get there gradually. Visit http://www.choosemyplate.gov/supertracker to find your desirable weight and for a number of tips and menus. An important component of a healthy lifestyle is to stay active by moving as much as possible during the day. 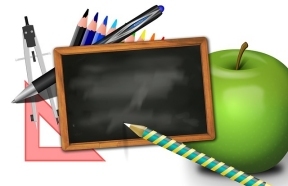 Try to make it a routine to walk with your children to school or to the bus stop. Dancing, walking, bike riding, and running are some of the activities you can do as a family together to help you stay active during the day. Families should try to exercise for at least 60 minutes. The benefits of healthy balanced meals go far beyond a fit body. You’ll move better and faster, have more energy and feel better. 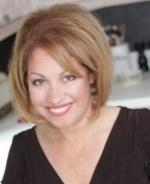 Sylvia Meléndez-Klinger is a nutrition specialist and leading expert in cross-cultural Hispanic cuisine as it relates to nutrition and health. She has been a consultant for major food and beverage companies, including Coca-Cola, and non-profit organizations for over a decade. Sylvia serves on several nutrition boards and has been recognized with numerous awards and accolades during her career.